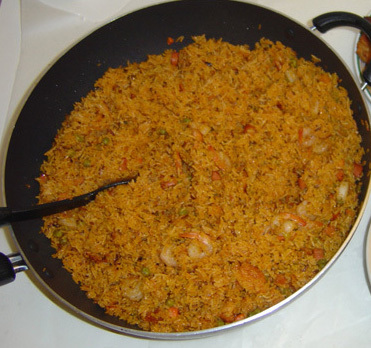 Jollof rice, also called 'Benachin' meaning one pot in the Wolof language, is a popular dish all over West Africa. It is thought to have originated in Senegal and Gambia but has since spread to the whole of West Africa, especially Nigeria and Ghana amongst members of the Wolof ethnic group. The dish consists of rice, tomatoes and tomato paste, onion, salt, spices (such as nutmeg, ginger, Guinea pepper or cumin) and chili pepper, to which optional ingredients can be added such as vegetables, meats and fish. The cooking method for Jollof rice begins with using coconut oil to fry finely-chopped onions, tomatoes and ground pepper (plus any other optional ground or chopped spices); adding stock; and then cooking the rice in this mixture so it takes up all the liquid. The rice takes on a characteristic red colour from the mixture. It can be served with cooked meat, chicken, fish, tofu or vegetables separately on the plate or they can be stirred in at the end. It is often served with fried plantain and salad. 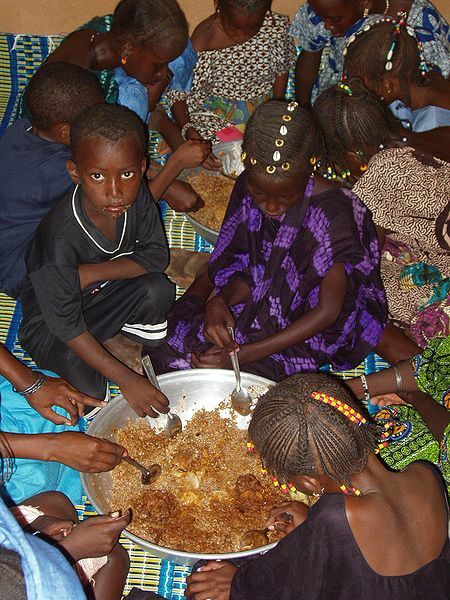 Left: Children in Senegal eating Benachin. Optional ingredients can include garlic, peas, thyme, African nutmeg, tea-bush leaves, partminger (a herb of the basil family), curry powder.